Discover delicious food with a vintage side. The wine offerings for the Pinot and Pork Wine Dinner at Ajax Tavern lined up in the order we sampled them. 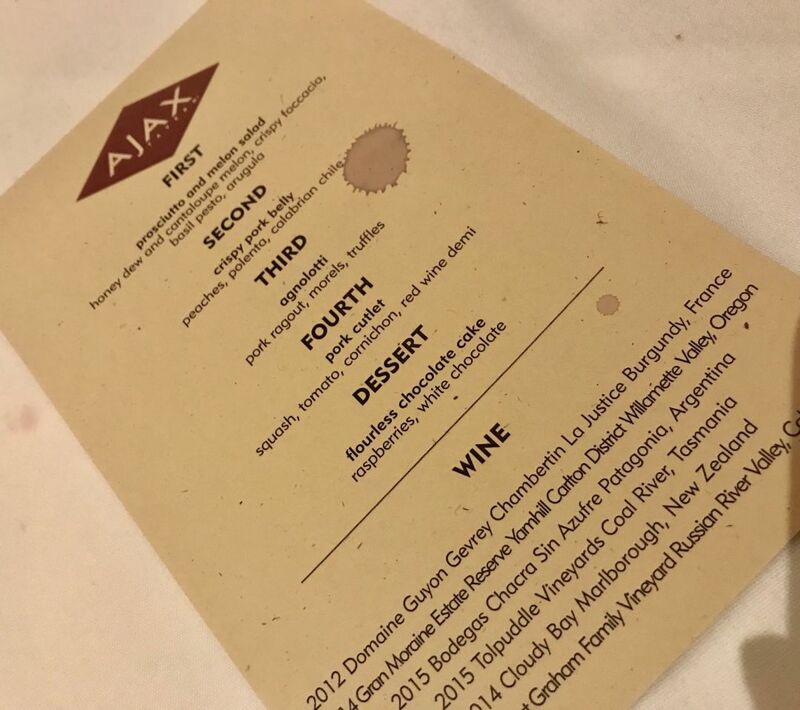 If the idea of attending a "wine academy" sounds intriguing yet intimidating, an Ajax Wine Dinner may be just what you need. A new program offered by The Little Nell Wine Academy on Saturday evenings at 6:30 p.m. through August, these multi-course dinners include a themed meal paired with five (or more) different vintages. The most recent theme was an adventurous exploration of pinot and pork. The meal highlighted local and seasonal ingredients across a wide array of palate-pleasing dishes. The six different pinot noirs were far ranging in taste and geographical origin, each with a unique nose and flavor. Besides being able to enjoy a delicious five-course dinner and wine pairings for just $100 a person (plus tax and tip), what made the evening so enjoyable is that it all felt completely approachable. Each wine was introduced by Sommelier Jesse Libby, with plenty of time for questions, discussion, and honest feedback. Libby engaged with everyone at our table, from true oenophiles to neophytes such as myself, with no inquiry being too silly. “It’s fun for us to showcase wines off the beaten path and pour ones that guests wouldn’t typically order on their own," he says. "Our goal is to expand their palate and introduce them to familiar styles of wine from unfamiliar places." 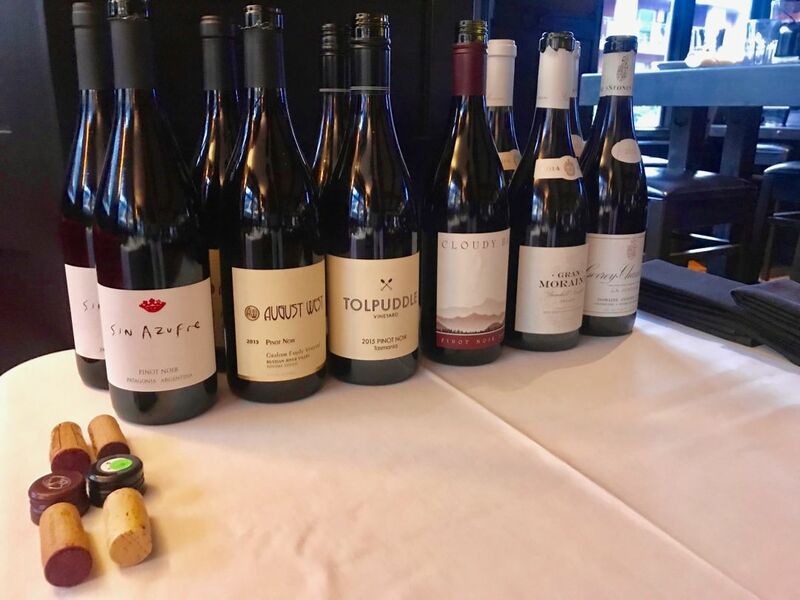 His selections ranged in price from around $50 to $150 per bottle and featured wines from California, Oregon, Tasmania, Australia, France, and Argentina. 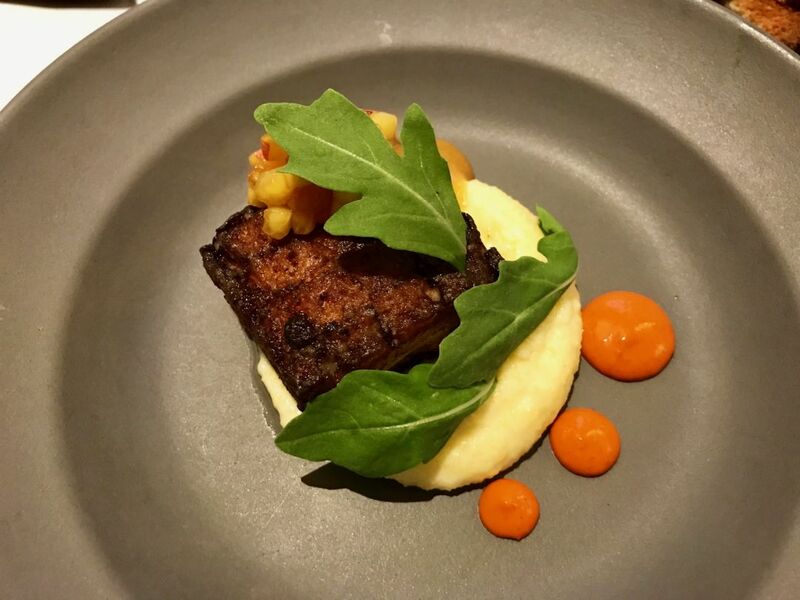 Crispy pork belly was served with peaches, polenta, and Calabrian chile. Our meal was overseen and presented by Sous Chef Alex Swecker. From crisped prosciutto and melt-in-your-mouth pork belly to an earthy pork ragout accented with black truffles and a schnitzel-style pork cutlet, the meal was creative and delicious. "We research each theme to gather ideas for the dishes, then create classic preparations with a modern twist. For the pinot and pork dinner, we used local ingredients, such as Palisade peaches with the pork belly, basil in the pesto sauce, and squash blossoms with the pork cutlet," says Swecker. "We have great relationships with many local farms and want to use fresh, local ingredients whenever we can." Swecker also handled my gluten-free request (made in advance) without hesitation. While pork and pinot noir isn't a surprising coupling, some of the other Ajax Wine Dinners have cast aside standard pairings in order to explore other food and wine combinations. Upcoming pairings include new South American and Peruvian cuisine, chablis and Mediterranean cuisine, and syrah and Colorado lamb. Another twist: the dinners are available for only up to 10 people at a time, and everyone is seated at a community table. In addition to trying perhaps-new-to-you-wines, you also get to meet other dining companions. The menu—complete with a few drips of red wine.